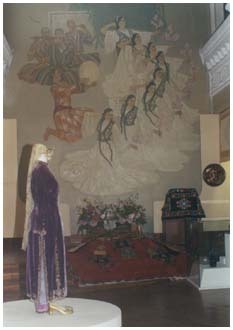 The Mukarram Turgunbaeva Museum was created in honour of the great dancer and organizer of the Uzbek mass stage dancing and an illustrations State Ensemble of national dances "Bakhor". 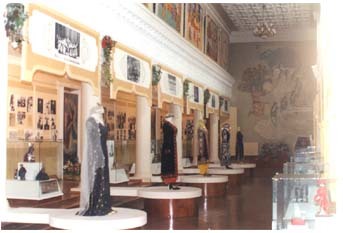 The side foyer of the concert hall "Bakhor" is allotted for the Museum. Its exposition tells about the history of the origin and development of the Uzbek dancing art, represents the stagesof the great actress's creative life, reveals the distinctions of her creative work as a ballet dancer, teacher and artistic leader. A dance as all other spatial-temporal kinds of art is alive only at the moments when it is performed. That's why it is so difficult to make the composition of the museum expressive. Placards of her concerts, leaflet programmers of her performances, photographs compose the basic of the exposition. Doing their best to produce a vivid impression on the visitors the organizes of the museum have found some emotionally coloured art devices reanimating the moments of life of the great dancer. 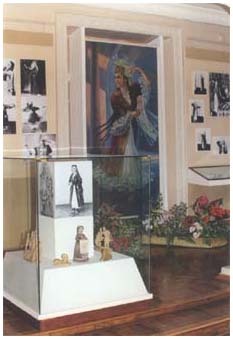 One of them is a diorama, carried out according to the recollections by Mukarram Turgunbaeva about her first performances for her countrymen. She covered a difficult part of formation an artist before becoming a national favourite. Mukarram was born in 1913 in the town of Shakhrikhan in Ferghana Valley. Having become an orphan at an early age she was brought up in the family of her uncle. It was her granny's influence, which encouraged her love for art, under the sounds of her tambourine Mukarram secretly learned to dance. At the end of 20s she studied at a Pedagogical College and won the first prize in the contest of young talented students, arranged by Mukhitdin Kari-Yakubov and Tamara Khanum. She became an actress of the experimental theatre of music and drama in Samarkand. Her performing of some dramatic parts was a great success. But true recognition came to Mukarram after she became a laureate of the first Olympiade of folk art in Moscow in 1930, and later in 1939 she played the leading part in the first classical Uzbek ballet performed on the tips of the toes "Shkhida". The basic of its plot is the fate of a young girl taking off her yashmak, ignore threats, and calling her countrywomen to follow her example. 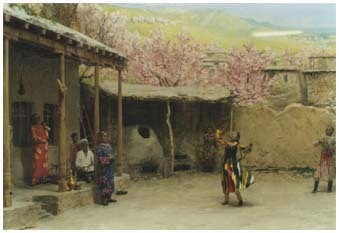 Scenery for the ballet is one more addition to the exposition of the museum. The culmination of the exposition is surely a making-up room of the great actress. The night table with the cheval-glass, the dress and footwear, making-up articles - all these items are intended to reproduce an exciting atmosphere, dominating here at the very moments before the actress appeared on the stage. Her suitcase, keeping recollections about tens countries of the world, an eternal partner of her tours is also offered. A considerable part of the exposition is devoted to the choreographical activity of Turgunbaeva, the process of work of dances "Munojat" (a prayer, the name of the melody), "Janon" (a beauty, the name of the melody), "Pakhta" (cotton), "Rakhat" (enjoyment, calt), "Tilla" (gold). The dance "Tanovar" danced to the music of an ancient Uzbek song is rightfully considered to be her top masterpiece. The expression of unshared love of a young girl, the rich variety of nuances of the filling she experienced became intrinsic content of the dance-song. 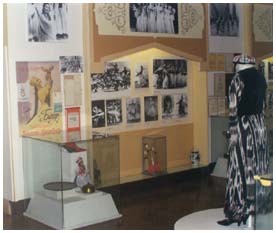 The last and the most important period of Mukarram Turgunbaeva creative activity is connected with the female ensemble of national dancing "Bakhor" which was organized in 1960 and which she directed until the end of her lifetime having been on tours in different countries of the world. Mukarram Turgunbaeva died on November 26, 1978. The curator of the museum is Khursana Mukhitdinova, a dauther of Mukhitdin Kari-Yakubov. She is the former soloist of the "Bakhor" ensemble and one of the celebrated dancer's pupils.